Designed to appeal to both novice and experienced cooks, this cookbook forms part of the "Look and Cook" series. Every single stage of each recipe is photographed in colour, from assembling the ingredients to serving the finished dish. A variation is given to each of the 25 main recipes, making 50 recipes in all. All the recipes have been developed and cooked by Anne Willan, the founder of the Ecole de Cuisine La Varenne. 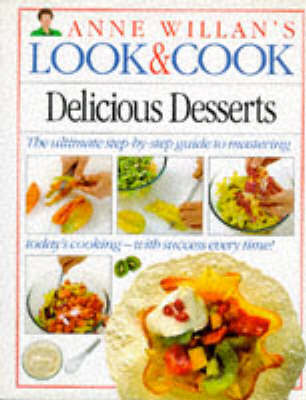 "Delicious Desserts" includes such recipes as "Snow Eggs", "Cinnamon-orange Creme Brulee", "Baked Lemon Cheesecake" and "Crepes Suzettes".